Our wide range of Conveyor System & Parts includes conveyor systems, belt conveyor systems and automated conveyor systems among others. To maintain the high quality standards, we procure the raw material from the most reliable vendors. We also customize our range to meet specific client requirements. We are a prime manufacturer and exporter of a wide range of parts of conveyor systems and the Belt Conveyor System is the most important component for any conveyor system. We have a very experienced intellectuals who have made it feasible for the world class product. We offer a supper class Plastic Modular Belts that are manufactured by different major keeping in mind and that suite the international norms. This could be use as multi purpose as well. Being the component of the conveyer system part it is use as worldwide. 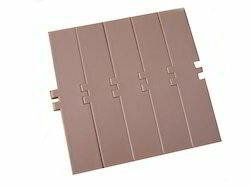 These belts are used as conveyer in conveyer belt. Our comprehensive range of Automated Conveyor System is designed for pressing glued corrugated sheets. The international quality range of sheet pressing machine is available in various configurations as specified by our clients. The machine is fully-enclosed and is adjustable by rotating handle provided on one of its side. It helps to provide even shape of the warp sheets, ensures durability and cost effective performance for a longer period of time. 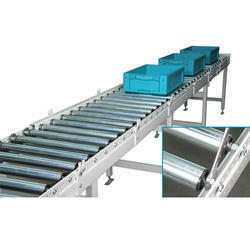 We are a renowned manufacturer of Roller Conveyor System that is extensively used in paper mills. These machines are known for their precision designs & technical accuracy and helps in the increased production of paper. It is designed for coating bitumen on roll of craft and laminated with aluminum foils to make laminated film for hot resistance. Our range is fabricated using high grade raw material, procured from reliable vendors and is available at most competitive prices. 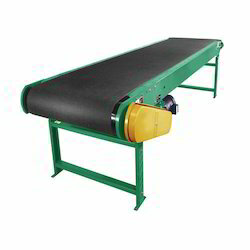 We are a prime Manufacturer and Exporter of a wide range of Round Belt Conveyor System. The array offered includes plastic modular belts, stainless steel slat chains, thermoplastic slat chains, UHMWPE wear strips & corner Tades, drive sprockets & idlers, side brackets & clamps and connecting clamps and handles and hinges. To maintain the high quality standards, we make use of high grade raw material such as nylon, polyacetal, UHMWPE and stainless steel that are procured from the markets of India, Germany and Italy. We offer best quality conveyor system parts, components & accessories and have been successfully catering to various industries. Further, to meet the diverse requirements of our clients, we also offer customization of products, to meet the specific requirements of clients. We offer Thermoplastic Slat Chains and it is available at a reasonable cost. We manufacture these chains by using high quality raw material taken from reliable sources. We supply this product across world wide. Our advanced and latest manufacturing unit is well capable of producing high quality conveyors parts which meets international standards.